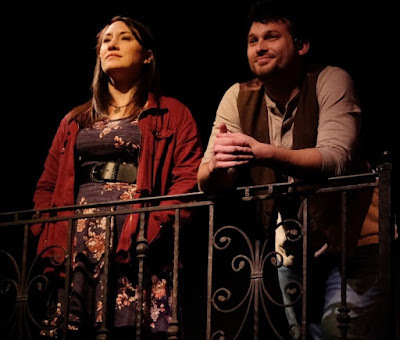 They meet up in an Irish Pub after she wanders on to the scene where he is playing his latest work. In spite of all that says no, they venture into a friendship that leads to a short- lived love almost fairy tale affair. (“Falling Slowly”). “Once” described as charming, different, whimsical, original and daring is based on the 2006 movie of the same name, sans music. 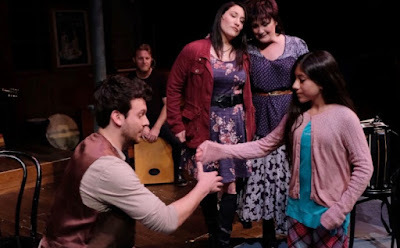 The stage adaptation with book by Edna Walsh and songs by Markéta Itglová (including the Academy Award song, “Falling Slowly”) premiered in 2011 at The New York Theatre Workshop and moved to Broadway 2012 where it won 11 Tony Award nominations. It came through San Diego via Broadway/San Diego in 2014 on its National Tour and yours truly was more than disappointed in the production staged in the too large, no connection to any of the characters, venue of the Civic Theatre. It’s a small and intimate show. 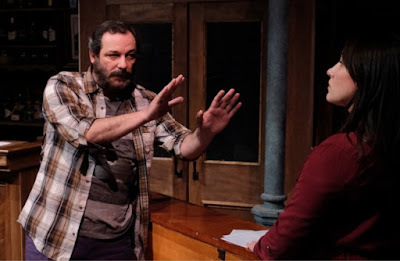 Enter Lamb’s Players Theatre and their amazing and exceptional ensemble, and astute and talented in her own right, director Kerry Meads who gives this production, yes, heart and choreographed by Colleen Kollar Smith and voila! All is right with the world with one exception, the sound (Patrick Duffy) was oft times inaudible and it was difficult to make out the lyrics. The star-crossed lovers, Girl and Guy though never admitting it, travel a ‘road not taken’. She is a single mother, not divorced and he is recently alone since his ‘once love’ left him for New York. Both are serious in this new relationship of theirs that doesn’t really come together, but ‘once’ in a lifetime, and not until the end; it’s a work in progress throughout. He lives with his Da (a soft spoken softie Kent Brisby) above the Hoover Shop and she lives with other Czech nationals, all musicians; her mother Baruska (a peppy and animated Deborah Gilmour Smyth with a wonderful Czech accent “Ej Padá Padá Rosicka”) and young daughter Ivonka (a charming Bianca Rodriguez on opening night). Most of the action takes place in a Dublin Pub/ Music Shop (designed by Sean Fanning) and belonging to high spirited but hilarious guitar playing Billy (Manny Fernandes.) What else does this talented guy do? His larger than life presence weaves humor throughout. 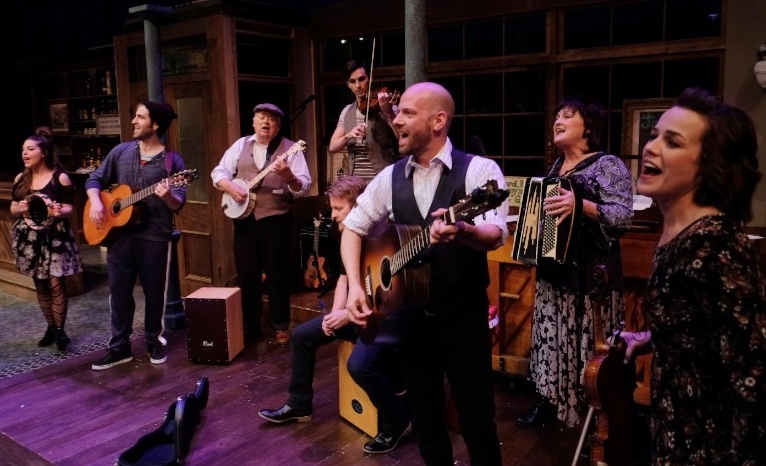 In the Pub before the show, patrons wander up to the bar and order drinks while the entire cast, musicians every one of them, sing, stomp, dance and move between patrons until Cusimano walks into the Pub and soulfully sings the song he wrote for his then girlfriend. “Leave”. He closes his guitar case and heads to the swinging doors when Girl steps in and stops him. From there it’s a push me pull you battle of how she encourages him to continue on in his career as a musician while he supports and encourages her musicianship on piano. “Falling Slowly”. Both leads are solid and persuasive with a good amount of electricity between them. Catie Grady’s Girl blew my mind in a role tailor made for her. As a company member and a Lamb’s Associate Artist she has been seen in many roles on this stage, but her heartfelt, heartbreaking performance on opening night took her to depths not seen before. Her performance is absolutely stunning. Her times at the piano are top notch as well. The large (12 member) ensemble of musicians are the spirit and backbone of this high-energy show that sports some amazing musicians that play a variety of interesting instruments and sing their way through an assortment of Irish music enough so to warm the heart of any Irishman, and then some, in the audience. The clever use of the musicians some of who are on stage throughout and every now and then become characters in their own musical. They are also ready during whatever scene changes take place to move props here and there. There are also some pretty active movements along the way creating an easy flow for characters to come and go. Those with instruments carried on and off stage (musical direction by G. Scott Lacy) Temi Hason has her own carry on cello. Multi talented, she sings and acts and does all with confidence and vim. Luke Monday is wonderful on his violin. James Michael Hale is the banker asked to give Guy a loan so he can rent out a sound studio to make some CD”s. He’s the guy with the fancy guitar (“Abandoned In Brandon”). Arusi Santi as Svec (last seen in Moxie’s “Ironbound) is a hoot as he drops his draws to muffle his loud drums. 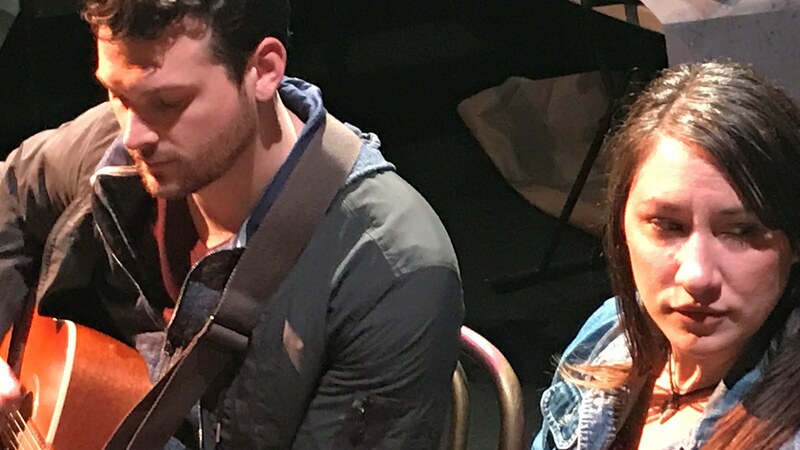 Abigail Allwein, Dave Rumley and Jimmy Marino complete the musically skilled cast. Rounding out the all inclusive and all around authentic look of the show are Jeanne Reith’s costumes, Nathan Peirson’s lighting and of course Sean Fanning’s all purpose double deck set overlooking the water from up above and Dublin Bar downstairs where the energy and music overflows and sentiment, hope and love percolates. Like other award winning musicals Lamb’s Players Theater has mounted, “Once” is high up on the list. “You’ve gotta have heart” and this one, above all, has lot’s and lot’s of it. Next up how about “Come From Away”?